Bratt Ratner was for sure not the no.1 choice for this project, but he tried his very best and got an awesome cast and great characters to work with: Anthony Hopkins as Hannibal Lecter, Edward Norton as Will Graham, Ralph Fiennes as Francis “the Tooth Fairy” Dolarhyde, Emily Watson as Reba McClane and Philip Seymour Hoffman as Freddy Lounds. The rights for all Hannibal Lecter movies belong since “Hannibal” to Dino De Laurentiis and he decided to milk that cow for whatever it takes (and even gave us the atrocious “Hannibal Rising”, for which he forced Thomas Harris to write the novel and screenplay). De Laurentiis thought that what the audience wanted most of all is to see more Hannibal Lecter, so Ted Tally added additional scenes to the script including him. But Hannibal Lecter as supporting character has the “Doc Holiday” effect (“Doc Holiday” is a supporting character in the Wyatt Earp story and tends to steal the entire show, because he is so charismatic). Remember: 18 minutes screen time in “Silence Of The Lambs” were enough to earn him the well deserved academy award for best actor in a LEADING role. So what the additional Hannibal scenes really do is to take away from the main story about the investigation of the “tooth fairy” murders. This entire part becomes incredibly flat and all the audience does is to wait for more Hannibal scenes, which actually makes the movie lame to watch. What I did was to get rid of all the unneeded Hannibal scenes to take the focus away from him, starting with the 10 minutes intro, where he was caught and continuing with scenes, where he was teasing Chilton. The result is a totally different movie, although my changes were actually minor. 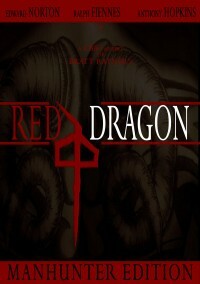 I think this version of Red Dragon is way more in the spirit of the original book and makes all characters (including Hannibal) appear with a lot more impact. Especially the great performance of Ralph Fiennes profits from the changes. Another thing that always bothered me in both movies (Red Dragon and Manhunter) is the original book ending, which I never liked. But I was not sure that the fanedit audience would prefer a new ending without a true showdown (and with the investigation actually not leading to the true defeat of the tooth fairy), so I created 2 versions, one with the original ending and one with a very different ending, which I like a lot better. To make it possible to have 2 different endings and still a good image quality on a SL DVD, I used seamless branching to present the movie versions. The breaking point is easily spot-able and the break can be a tad long, depending on the DVD player, still it works rather well. Two separate endings via branching. When my “First Contact” edit did not work out the way I intended it, I switched to this one. The idea for this fanedit is rather old, but I never got around to actually do it. This fanedit also marks my complete swtich to Sony Vegas as video editor, because I am sick and tired of the Ulead Media Studio Pro 8.0 bugs. The fanedit was created with Ulead, all deleted scenes, menus and the trailer were created with Vegas. Byebye Ulead. I will never return. Editing the movie was quite easy, except for the earlier introduction of Francis Dolarhyde and the additional ending. Encoding gave me a hard time because Ulead did not always add interlacing to the progressive source, which I could not get rid off completely (and I tried many times with many different settings, filters and programs) until I switched to the original mpg source (which Ulead can handle very well). recolored the entire movie to a less reddish and more cold tone. This is my first ever fanedit and rest assured it will not be my last, because what I got to watch here was simply put great. The offer of 2 different endings pleases both the conservative and the liberal fan. Taking out Anthony Hopkins on such a big scale makes it sound like a major offence, but in this case it totally is not – and I hope CBB will edit Bram Stoker’s Dracula sometimes and do the very same thing to it. Hopkins is sometimes just over-acting, stealing the entire show, making a movie too much focused on him, when he is not even the leading role. CBB has discovered what was wrong with this movie and boldly addressed it. Of course it is not Silence Of The Lambs and also of course Anthony Hopkins looks too old in this prequel, but still this fanedit has a density, thrill and atmosphere now that I for one would have never believed it could have. Audio and image quality were superb. This one replaces the original on all levels for me. Thank you.